Friday night I took a group of friends to Brew Fish in Marion for my first dinner experience (I have enjoyed several lunches there, but this was my first dinner). Let me start by saying this is great spot to bring a crowd! They don’t take reservations for parties smaller than six and it’s so popular, you may have to a wait a while for a table on a midsummer weekend night. It’s also not a Dock and Dine, but it’s not very far from Burr Brothers if you’re staying overnight in Marion. Burr Brothers offers both moorings and transient slips on Dockwa. Don’t be scared off by the number of cars in the parking lot — this is a big restaurant. It actually consists of 4 separate spots where you eat and drink. There is an indoor sit down restaurant, an outdoor area, a large bar area with hi-top tables and an outside area with a bar, a raw bar, and a fire pit. We ate in the bar at a high top for eight. The inside bar atmosphere is very lively with the feel of an upscale sports bar. Server Megan with the great memory! 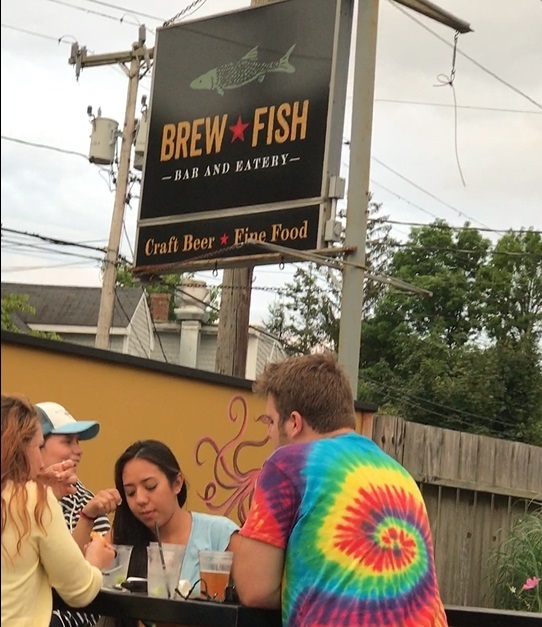 Having posted and read a number of reviews on Brew Fish, I can tell you that the only complaints I’ve heard is that it’s noisy and the service slows down when it gets busy. It was a tad loud, but not bad for the crowd and totally appropriate for a bar. In terms of service, you’ll get no complaints from us. We had a great server – Megan, and everything came out as fast as I’ve ever seen for a party of eight. The first thing that impressed us about Megan, was her ability to take appetizer and dinner orders for all eight of us without writing anything down. I’m always skeptical of this, but if you can pull it off, it’s really cool and Megan pulled it off! We gave the menu a run for her money and ordered a variety of dishes. Several of us had the Brew Fish and Chips ($16.99) and it was perfectly executed. I’m not a fan of Beer Batter Fish and the menu described theirs as “a light beer batter.” You’d never know it. The coating was quite thin and very crisp. My bother-in-law Paul ordered his fries “well down,” which is something I’ve never heard. I’m not sure they did anything different, but everyone loved the fries. Interestingly, Fish and Chips is the only fried seafood entree they offer. Randy and Gail both ordered the Baked Seafood Combo ($24.99). Randy substituted his side for Mac and Cheese ($2 up charge). This was also perfectly executed; not too buttery and not buried in bread crumbs. The Mac and Cheese could have been a meal on it’s own. Large and perfectly browned and crunchy on top. 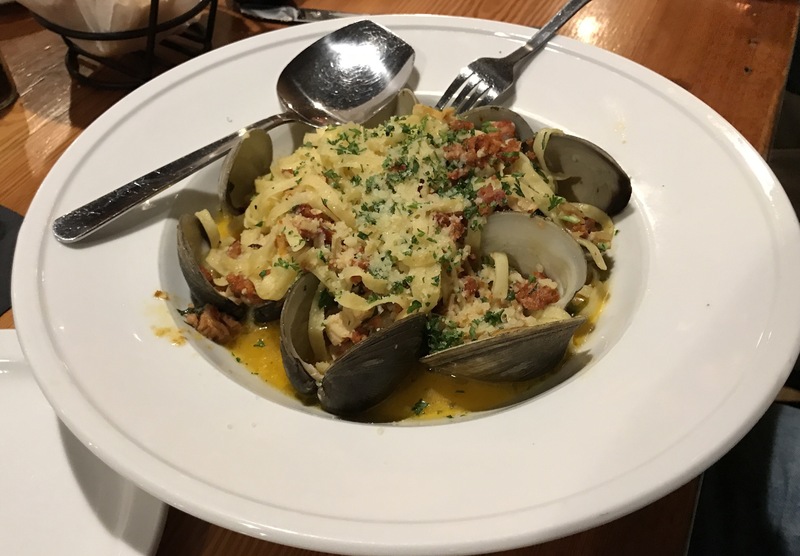 Rudy went in an entirely different direction and ordered the Portuguese Linguini and Clams ($16.29). Rudy reported that the dish was garlicky, but not overbearing; the sauce had just the right consistency for mopping up with a crust of bread. ​​After dinner Rudy and I went to the outside bar while Sue and her family finished their drinks inside. 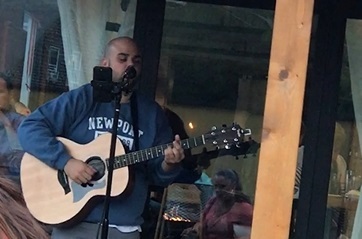 We grabbed a couple of fish shaped Adirondack chairs by the fire pit and took in a little live music from Colby Gamboa on Acoustic guitar. This is really a complete restaurant, something Marion has lacked for decades. Thanks, Dave. This has changed a lot from the Short Wave where we always went for a drink and a pizza. Maybe one day we can get to try it out.